Narasimha Karumanchi’s Data Structure and Algorithmic Thinking with Python is designed to help programmers as well as test takers of competitive exams and those looking for jobs by making them more confident with data structures and smarter in finding different solutions to approaches to one problem. The various puzzles in the book builds a person’s analytical ability thus placing him in a better position of facing interviews. About CareerMonk Publications Based in Hyderabad, CareerMonk was founded in 2007 by Amazon Corporation India’s former senior software developer, Narasimha Karumanchi. The other authors in this publication include Prof Srinivasa Rao, and Prof. A Damodaram. Some of the other books by this publication includes IT Interview Questions by Narasimha Karumanchi, Elements of Computer Networking and Data Structures and Algorithms Made Easy in Java. 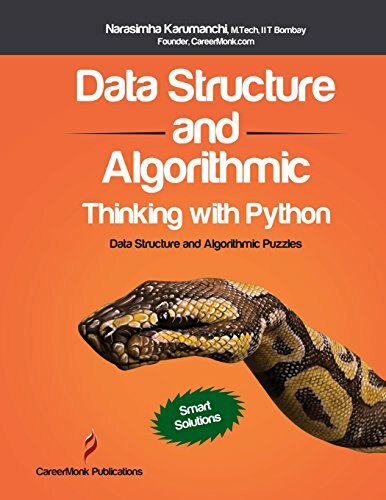 Buy the book Data Structure and Algorithmic Thinking with Python from Ideakart.com.